while taking the tour around the Viking World museum! 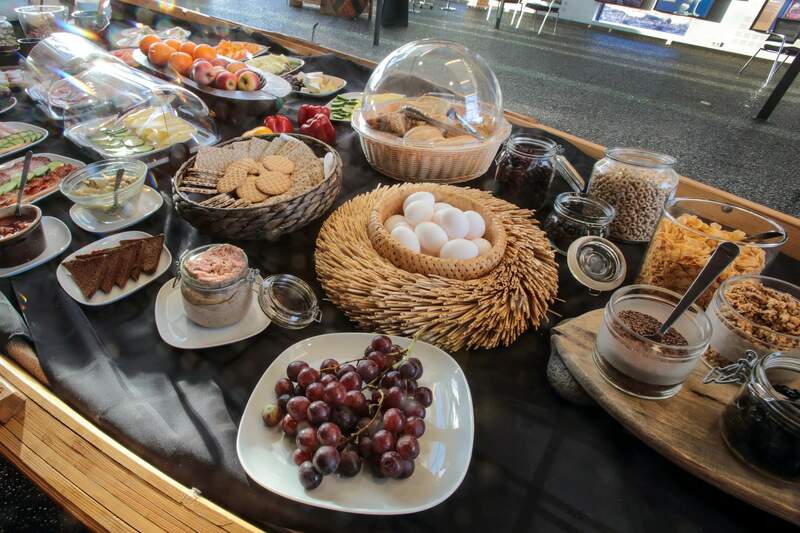 Located just by the entrance of the museum, the Viking World Café offers tasty refreshments to all its visitors throughout the whole day. 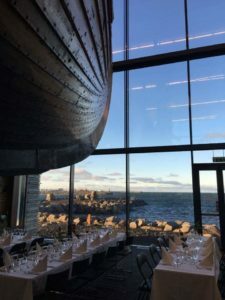 The remarkable design of the museum building lets you absorb the beauty of the Icelandic landscape or nearby harbor while you sip your drink or taste anything of your choice from our menu. 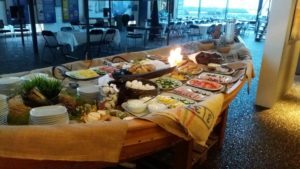 The seating area of Viking World Café is located just underneath the ship the Icelander (Íslendingur) and contributes to a very unique gourmet experience. 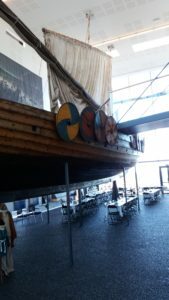 We are happy to welcome everybody who wants to spend some time in our café even if you do not plan to visit the Viking World Museum itself. 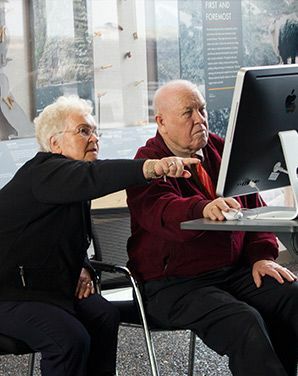 Viking World Museum and Café is wheelchair accessible and all the visitors have a free wi-fi access. 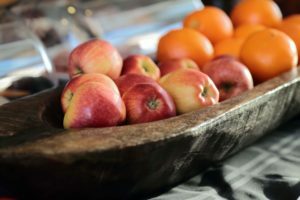 As breakfast is the most important meal of the day we offer our visitors classical continental breakfast including some typical Icelandic products. This offer is ideal for those who arrive early to Iceland, transit passengers or stop-over passengers who want to start exploring the Nordic culture from the very beginning. Please use the email [email protected] for individual and group bookings. 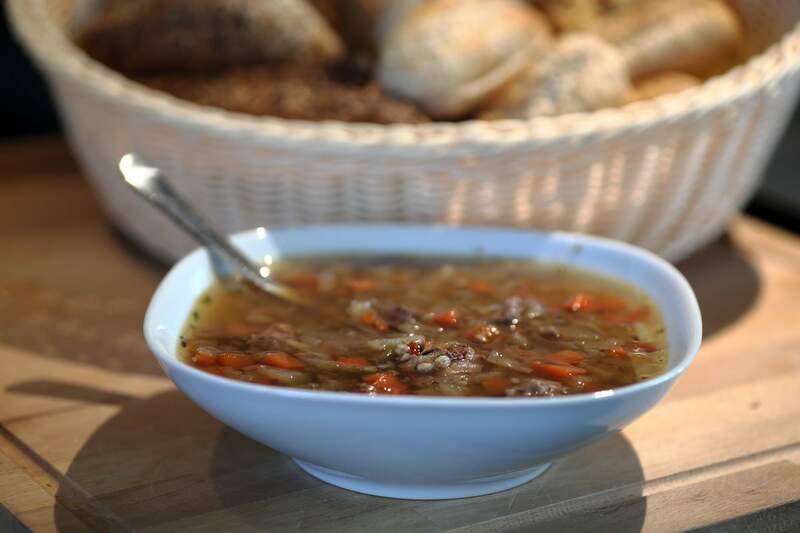 We offer a selection of soups that are served with freshly baked bread and Icelandic butter. You may choose from a traditional Icelandic Kjótsúpa (a lamb broth with pieces of meat and veggetables) or vegetarian soup of the day. 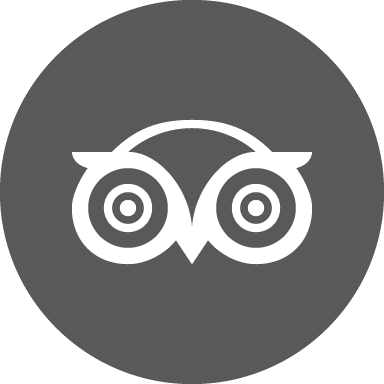 Our aim is to serve you with fresh and local food that you can experience only when travelling in Iceland. This offer is available for individual visitors as well as groups. Please use the contact email [email protected] to book a group of more than 5 persons. Dinner buffet is available only if pre-booked for groups (15 persons or more). 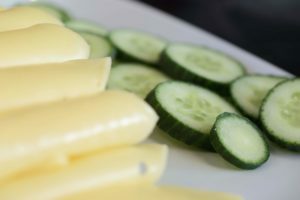 Evening buffet is a self-service buffet combining selection of soups. Price for the evening buffet incl. admission to the museum: 2900 ISK/ per person. Take a break and enjoy the unique interior of the museum that is offering magnificent views on the surrounding nature. 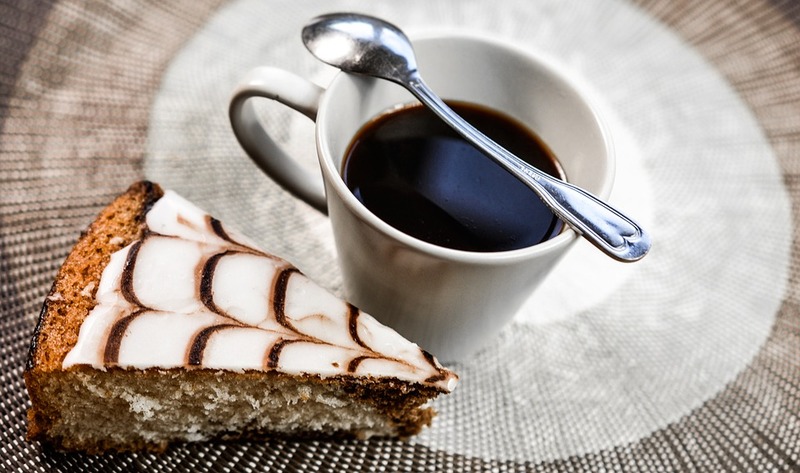 Boost up your energy with a cup of hot coffee or tea and combine it with a slice of delicious cake or a sandwich from our daily offer. 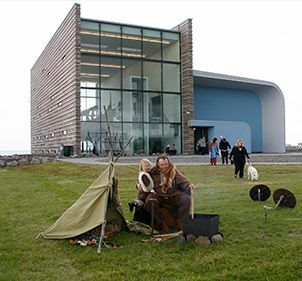 Viking World museum is not only a place where you can learn more about Viking history and culture but also a place where you can relax with your family and friends. We are more than welcome to help you host and organize venues of any type in the Viking World museum. You may book our conference room (70m²) for various meetings catering or even presentations. The conference room is equiped with data projector and microphone and holds up to 100 seating places. Reservations can also be made for private parties and receptions. The house is especially convenient for stand-up receptions. Please use the contact form below for further information regarding reservation and catering. We offer guided tours of the museum for groups of up to 20 at the time. The tour takes about 30 minutes and is available in English. The price is 10.000 ISK. Guided tour needs to be booked at least 1 day in advance. Large groups can get discount of admission. 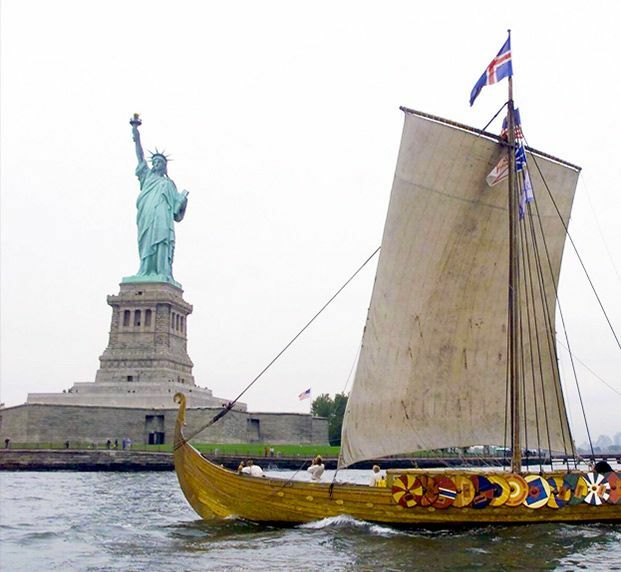 Viking World’s main attraction is the magnificent viking ship the Icelander (Íslendingur) which was sailed to New York in the year 2000 to commemorate Leifur Eiríksson’s journey to the New World a thousand years earlier. 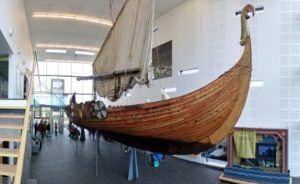 The Viking ship the Icelander is an exact replica of an old Viking ship called the Gokstad ship, which was excavated from an ancient burial mound in Norway in 1882. The Gokstad ship was very well preserved, and scientists were able to date it back to A.D. 870, the time of the settlement of Iceland. It is therefore likely that the settlers of Iceland sailed ships similar to the Gokstad ship. 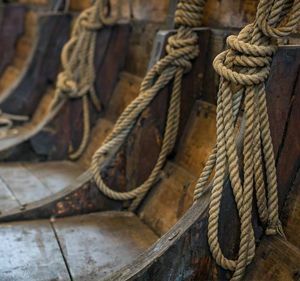 In the Viking era, a ship like the Icelander normally had around 70 crew members, thus accommodating a double shift of rowers for the 32 oars. In the middle of the ship there was a sandpit to support an open fire, and livestock such as lamb would provide fresh meals for the long voyages. The Icelander is a worthy representative of the ships that sailed the North Atlantic a thousand years ago. Like the original Viking ships, the Icelander is a fast and exceptionally stable ocean-going vessel. Construction of the Icelander began in October 1994 and was finished a year and a half later. The ship was launched in March 1996. The ship is made of pine and oak which was carefully selected in Norway and Sweden. The sail was manufactured in Denmark. When it came to designing the bow, many things were taken into consideration. The bow’s height was used for two purposes, both for the figurehead, which had to be visible from afar, and as as shield from high waves during sailing. The Icelander is made of 18 tons of wood and 5,000 nails. It is 22,5 m (75 feet) long and its beam is 5,3 m (17,3 feet). Its draft is 1,7 m (5,6 feet) and its average speed is 7 mph while top speed is 18 mph. To begin with, the Icelander was used to educate Icelandic school children on the Viking era but later sailed to North America. The Leifur Eiríksson Millennium Commission was the principal sponsor of the voyage of the Icelander. The Commission organized nearly 230 cultural events at some 70 venues in the USA and Canada for the year 2000. On its voyage westward across the Atlantic, Icelander with its crew of 9, called at various ports in the United States and Canada, and entertainers sponsored by the Millennium Commission took part in local celebrations. 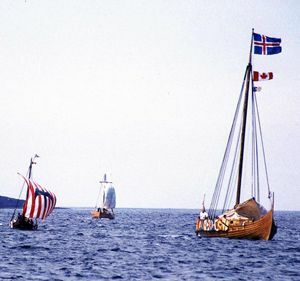 The Special Celebrations Corporation of Newfoundland and Labrador, Canada, hosted a major celebration on July 28, when the Icelander arrived in L’anse aux Meadows, the only authenticated Viking site in North America. 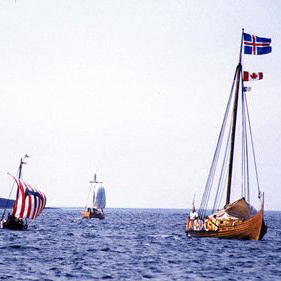 Numerous special events ensued in the wake of Icelanders momentous retracing of Leifur Eiríksson’s voyage. The ship arrived in New York on October 5. After the ship’s arrival in the United States it was stored in Westbrook, Connecticut for a few years. In 2002 the town of Reykjanesbær along with other parties made a decision on buying the ship and bringing it back home. During the following years the Icelander was stored outside until it received a final home in a brand new exhibition house in the fall of 2008. The ship now rests on pillars which lift it one and half meters up into the air. This makes it possible for people to walk straight under the ship and enjoy its remarkable structure. The following excerpts were published in the daily paper Morgunblaðið, June 16 2000. The vikingship Íslendingur (the Icelander) will set sail on Iceland’s Independance Day, June 17, to take on the long voyage to the New World celebrating the millennium of Leifur Eiríksson’s journey. The viking ship Íslendingur was built in the years 1994-1996. . . . The origins of the ship be traced back to 1882, when archaeologists in Norway excavated the famous Gokstad ship. 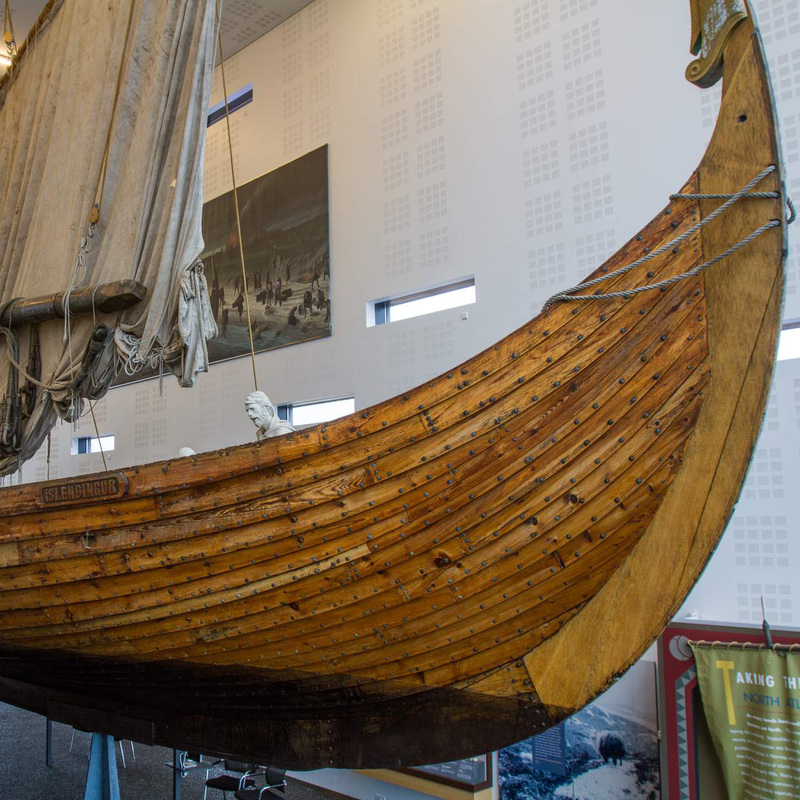 The Icelander is an exact replica of the Gokstad ship, the pinnacle of Viking craftsmanship. The viking ships have usually been divided into two groups, longships and knor (knörr), the longship being rather slow freighters whereas the knor was smoother, faster and more suitable for warfare. Many specialists believe, that the Gokstad ship might have been an attempt to combine the best qualities of both types, the stability of the knörr and the speed and manoeuvrability of the longship. The conclusion is that Íslendingur has proven to be a fast and extremely steady ocean liner. The viking ship’s last stop before it left the shores of Iceland and headed to Greenland was Búðardalur. It is the closest harbour til Eiríksstaðir in Haukadalur, where Leifur Eiríksson is believed to have been born. When plans were made for the journey, it was considered respectful to begin the voyage there and to follow in the “footsteps” of Eiríkur and Leifur. The seaways from Iceland to Greenland and then on to America were far from being the easiest one in the world. It was clear that it would never be an easy voyage on a viking ship. They made sure to leave enough time for this part of the trip. The ship had a good crew, most of the crew members have known each other since childhood in Westman Islands and have experienced quite a few things. The story of the Viking expansion across the North Atlantic. 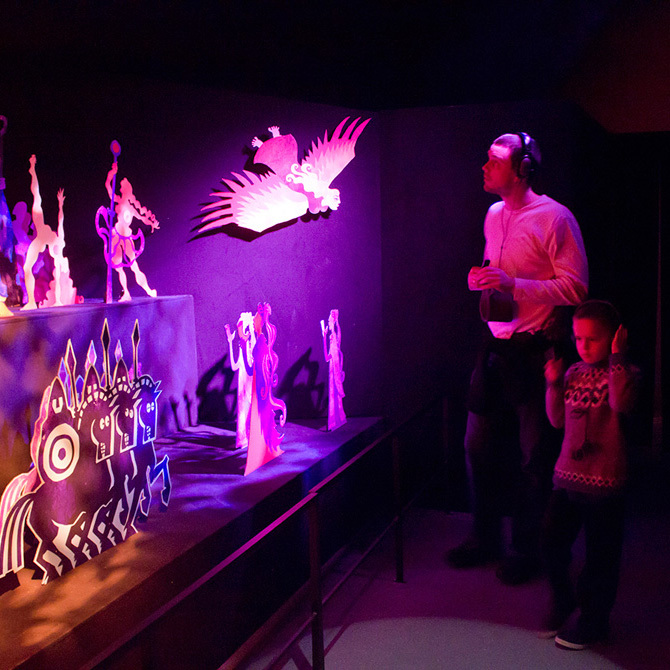 The exhibition was produced in cooperation with the Smithsonian Institution in USA as a part of the millennial celebration of Leifur Eiríksson’s journey to the New World. The Vikings (from Old Norse víkingr) were seafaring north Germanic people who raided, traded, explored, and settled in wide areas of Europe, Asia, and the North Atlantic islands from the late 8th to the mid-11th centuries. 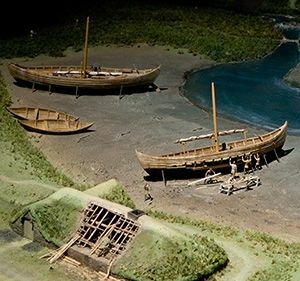 For two centuries beginning about a.d. 800, Vikings were everywhere, sailing the North Sea, rounding Spain to the Mediterranean, navigating eastern Europe’s inland rivers to reach the Black Sea and the Middle East. Particularly in Ireland and Russia, Vikings made inland forays to capture slaves. But not all Scandinavians who ventured out of their homelands were raiders. Some were mercenaries willing to fight for hire, much sought after in the Byzantine Empire. Others were settlers, and many were merchants looking for livelihoods, not loot. Without their remarkable ships, the Vikings would not have shaken Europe’s security. Slender and shallow-drafted, Viking ships were quick under sail and nimble when rowed. They allowed raiders to scourge coastal villages and monasteries, or to strike deep inland up fjords and rivers. An average-sized ship carrying thirty men could arrive without warning, advance onto the beach, wreak havoc, and slip away before the overwhelmed victims could mount a defense. The largest vessels could carry one hundred men and several horses. As empty lands beckoned, Norse seafaring farmers set forth. The times were ripe for leaving the homelands. Shipbuilders had perfected sea-going vessels, and the population was booming. Taxes and new rules prodded the restless in Norway, while Vikings in the British Isles had heard reports of islands inhabited only by Irish monks. By the early 800s, Norse land seekers were on the move. The warmer temperatures of the period made the North Atlantic islands especially attractive. In the Faeroes, Iceland, and Greenland, the Norse could support their livestock and their way of life. All they needed was a supply line to iron, timber, and European markets. 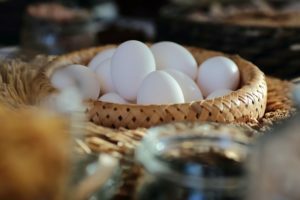 Vogur in Hafnir: Farmhouse or Outpost? 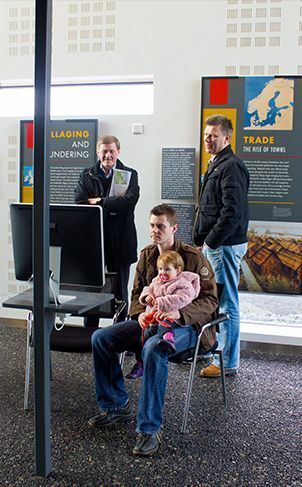 The Settlement of Iceland exhibition deals with archaeological findings from the Suðurnes/Reykjanes region. Remains from the oldest occupation on Reykjanes peninsula from the ninth century. When the ruins of a longhouse or skáli were found in Hafnir, which is a small village on the Reykjanes peninsula, it was believed to be a traditional homestead from the Age of Settlement. It could even be the farm of Herjólfur Bárðarson, the settler of Hafnir and great-grandfather of the great seafarer Bjarni Herjólfsson. 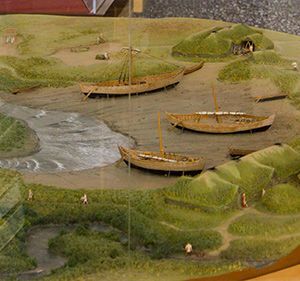 Bjarni and his crew are believed to have been the first Europeans to lay eyes on the mainland of North America. When archaeological excavations commenced in 2009, it was revealed that even though the longhouse was conventional in form, the outhouses that always accompany such structures were completely missing. Is it possible that the ruins are not those of an ancient farmhouse? Was this instead the outpost of explorers and adventurers, like the buildings of Norsemen in Newfoundland? Such a building would have been used for a short period of time each year as a base for exploration and resource utilisation. Iceland was one destination en route further west, to Greenland and mainland North America. During the Viking Age, a vast number of people travelled through Northern Europe in search of a quick profit. In summertime food was plentiful: birds nested in the cliffs, seals and fish populated ocean and lakes, and along the coast there was driftwood and the occasional beached whale to be found. The teeth of walruses and whales were particularly sought after and highly valued; indeed, they were often called the ivory of the north, or white gold. 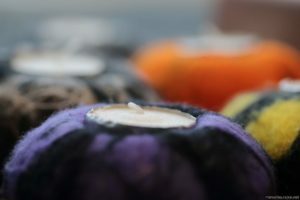 They were used for the carving of a variety of precious items. There are items on display in Viking World that were found during the excavation in Hafnir as well as photographs and illustrations. 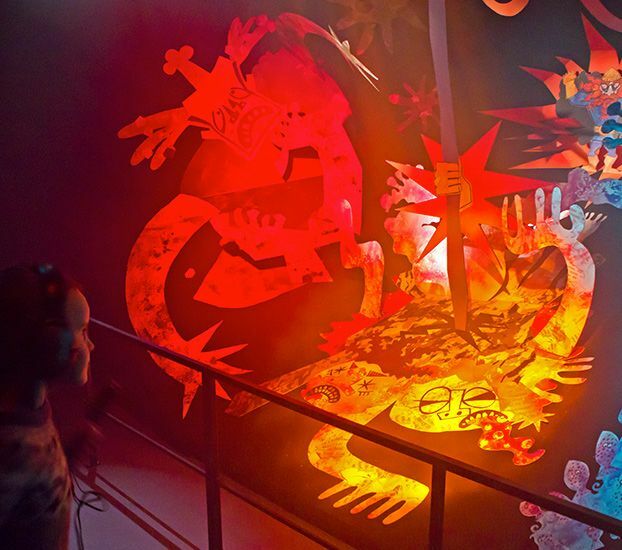 This is an exhibition on Norse mythology and myths. 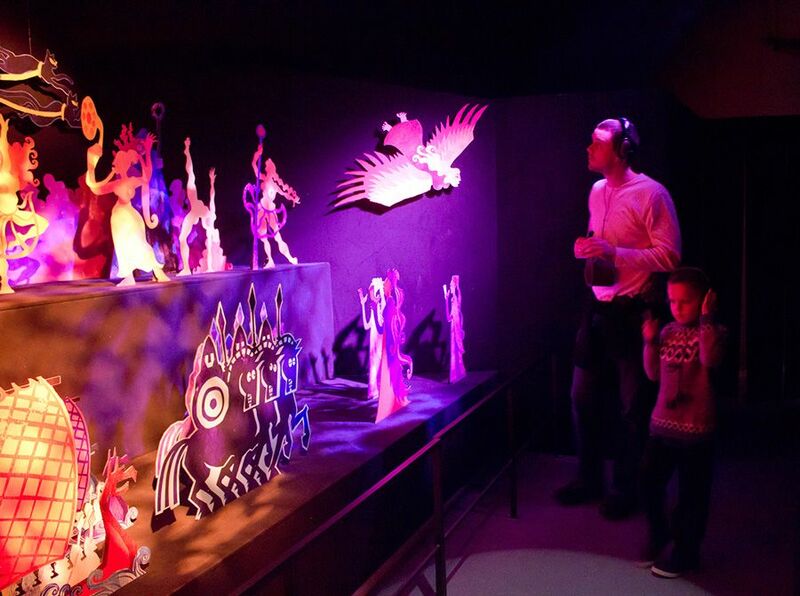 The world of the Gods vividly appears through visual arts, storytelling and music. 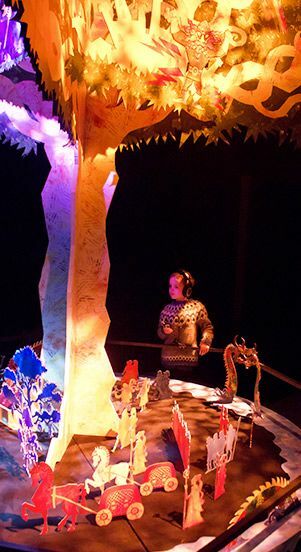 Audio guides are available in four languages; Icelandic, English, German and Danish. Fate of the Gods introduces you to the worldview and religion of our ancestors some one thousand years ago. Come and learn about the society of pre-Christian Scandinavians and meet the gods and goddesses they worshipped. In Scandinavia around the year 850 A.D. people believed that the earth was round and flat and surrounded by water. In this ocean at the edge of the world lay the terrible Midgard serpent; he encircled the earth and bit his tail. The world-tree Ash of Yggdrasil was the axis of the flat earth. In the world of the gods the three norns of fate watered the tree every morning to keep it alive; if the world-tree dried up, withered and died, the world would be destroyed. In Asgard, far above the world of men, the gods lived. Their leader is Óðinn, the god of rune-magic, wisdom, poetry and war. Once in the beginning of times when the world was still young and evil had not yet entered it Óðinn was walking along the shore with his two brothers, Vili and Vé. By the shoreline they came upon two tree-trunks that had floated thither down a river. Of the tree-trunks they made two human bodies, a man and a woman. Then they stood and looked at the lifeless figures and realized that more had to be done. Óðinn gave them life and breath, Vili gave them thought, sense and movement and Vé gave them faces, speech, sight and hearing. The two humans were named Askur and Embla. The gods gave them Midgard to live in and from those two all mankind is descended. Mankind fought for survival on the flat circle of the earth. The existence and welfare of men was however entirely reliant on the goodwill of the gods. They constantly had to renew and maintain the gods’ benevolence towards them. This they did by performing various religious rituals and ceremonies on various occasions and in different seasons. That was how they worshiped their gods. In each region people engaged in ritualistic worship a few times a year. Such assemblies were usually held and organized by the greatest chieftain and all free-born men of the district came to his homestead and took part in these ritual feasts. In late summer people gathered together to thank their gods for good crops and the gifts of the earth, but also to secure mild weather in the coming winter. In the middle of the dark winter people worshiped their gods to secure that the sun would start its course anew and the seasonal cycle continue. Finally, by the end of winter, people carried out their rituals to ensure growth and fruitfulness of the earth during the summer season. They would ask for plentiful fishing and good health and fertility of man and beast. There were also special rituals for victory in wars and luck on long journeys. At such religious rituals the gods were usually offered votive gifts, both weapons and precious things which were thought to please them. Often animals were sacrificed too. One part of the rituals was to drink a sacred mead as a tribute to those gods whose influence was most needed at each time. Every nine years a great religious and communal festival was held to ensure the continuous existence of the world. People travelled from far and wide to these gatherings, which lasted nine days. The festivals were usually held outside and the ritual activities performed in holy groves. Such groves were considered to be boundaries between the worlds of men and gods and the trees there were holy because they were symbols of the great world tree itself, the essence of creation. 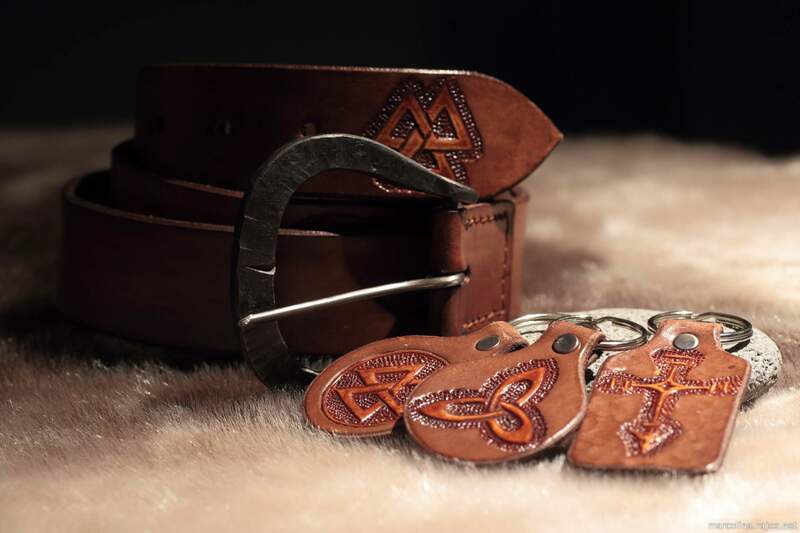 Looking for an original souvenir or gift from Iceland for your family & friends? In the Viking World souvenir shop you find various Icelandic-themed products mainly of local production.Whether you are looking for a hand-made piece of clothing, jewelry, household decoration or any interesting book, captivating pictures or postcards to send to your closest, here you find it all. The unique interior of the museum and shop itself is going to contribute to a unique shopping experience. While shopping you can also enjoy a cup of freshly brewed coffee and breath-taking views on the Icelandic landscape. 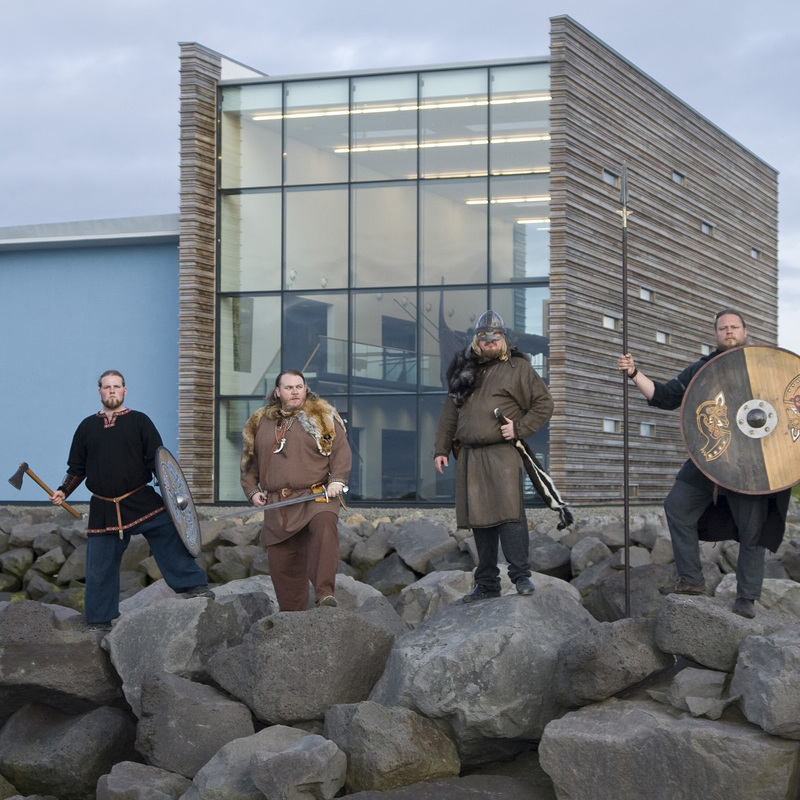 While touring our beautiful country you are going to learn plenty about Viking sagas that have been shaping Icelandic society from its very beginnings. Majority of the Sagas are being nowadays preserved in its written form and serve as a source of wisdom not only for the locals but for the tourists as well. Saga books are a perfect souvenir for everyone who wants to have a better understanding of the Vikings and their way of living. 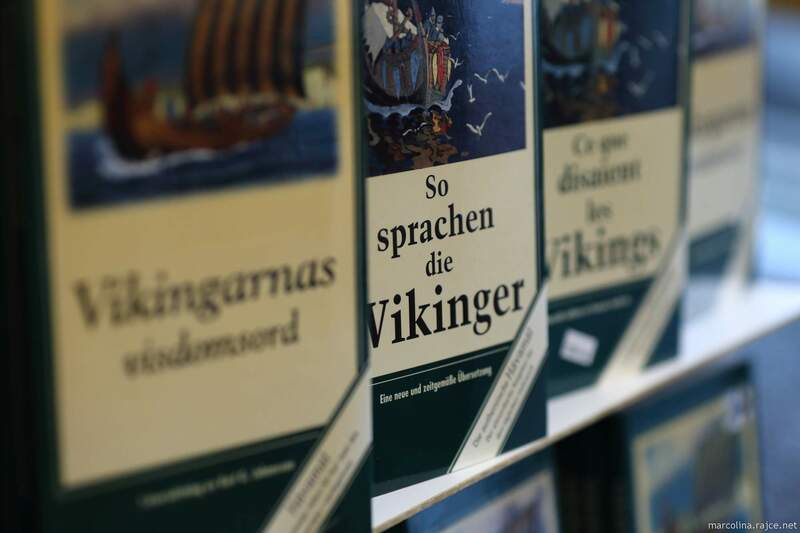 In our shop you find a wide selection of various books depicting Viking culture, folklore and natural wonders of Iceland. Iceland is also a home to one of the most common domestic animal – sheep. This animal is not only a source of food but its wool is being used to create various clothing and decoration items. 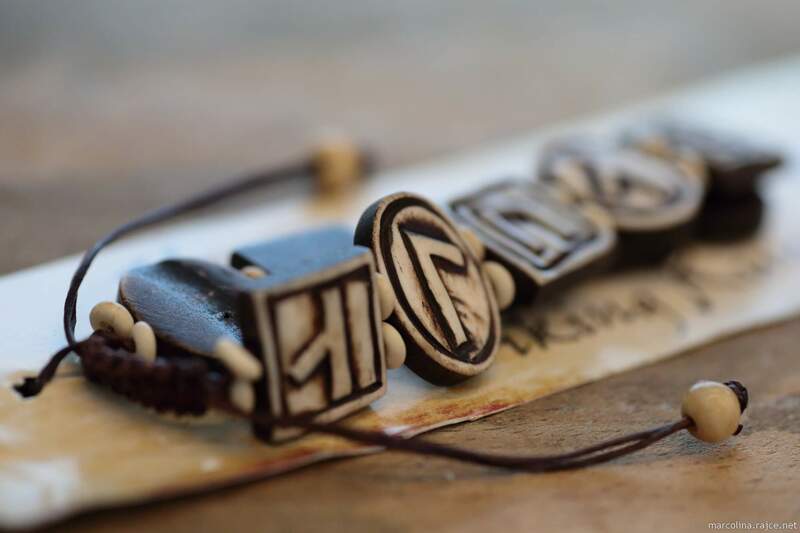 Hand-made souvenirs that you find in our shop come from local craftsmen and are unique in their design. 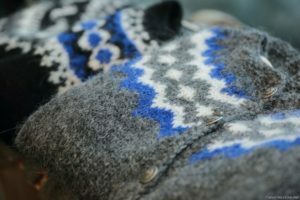 Woolen sweaters, vests and gloves from our shop are going to be not only a unique fashion piece in your wardrobe but also of a great protection while on a hike in the Icelandic wilderness! Serve your dishes in the Viking style! 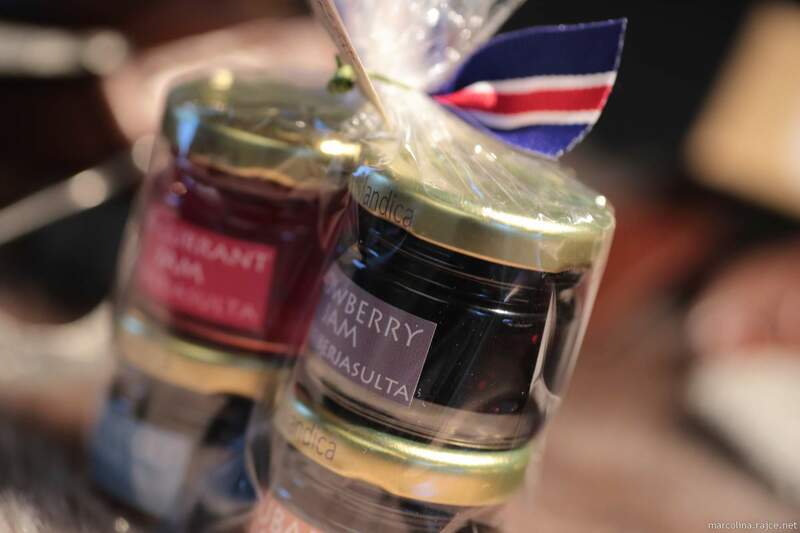 Surprise your family and friends with unique flavors – lava salt, Icelandic herbs seasonings, teas and jams combined with some typical Icelandic delicacies will give your culinary creations a totally different dimension. Kitchenware with the Viking mythology motives will only contribute to the overall unique atmosphere. 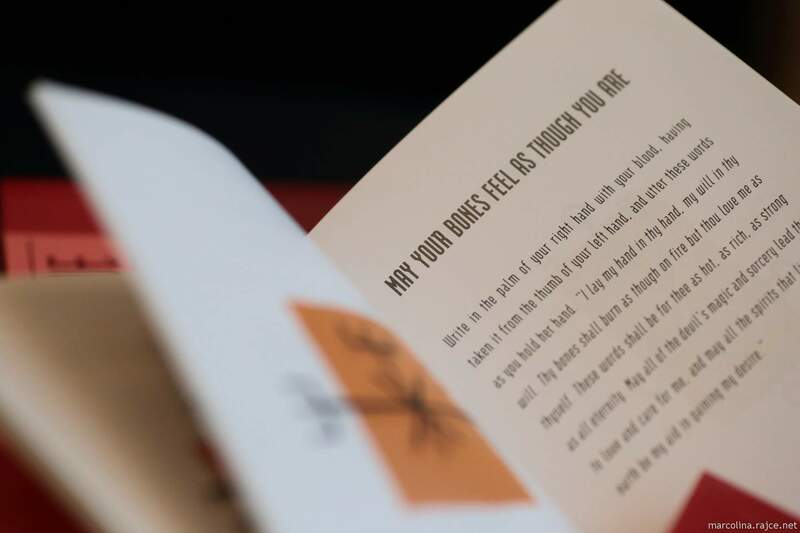 Get inspired in our souvenir shop! Iceland is a country that is going to overwhelm you not only with its unique natural wonders but also with its culture and traditions! 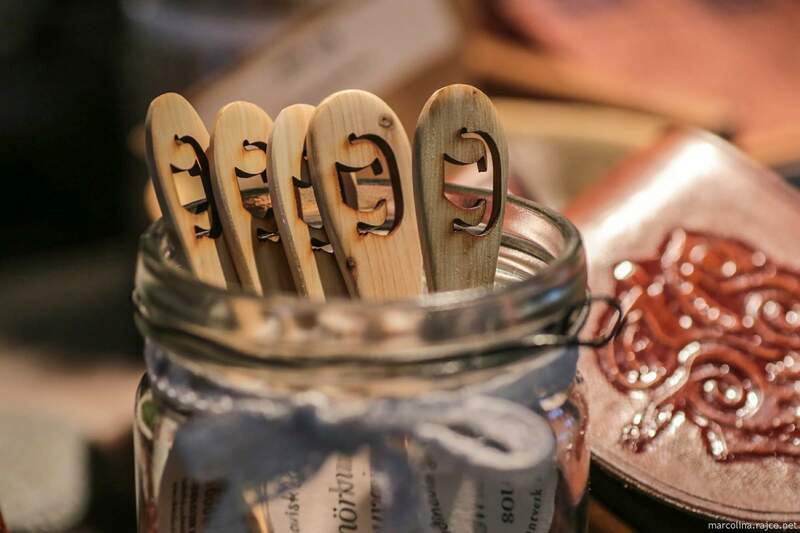 Creativity and inspiration of the Icelanders comes predominantly from the surrounding nature and historical Sagas.In our souvenir shop you find many interesting items that are going to bring you back to Iceland just in the blink of an eye. We are the home of the Viking Ship Íslendingur (the Icelander). 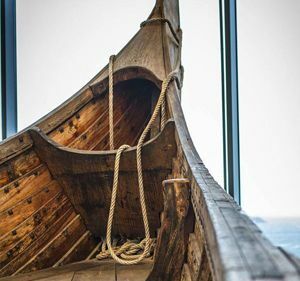 Built in 1996, the Icelander is an exact replica of the famous Gokstad ship, a remarkable archaeological find of an almost completely intact Viking ship, excavated in Norway in 1882. 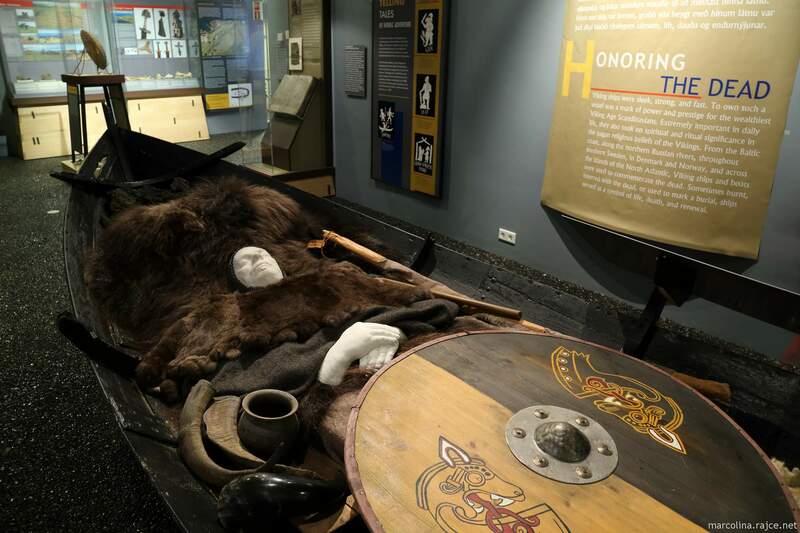 At Viking World you can also find the Viking millennium exhibition produced by the Smithsonian Institution called Vikings: The North Atlantic Saga. 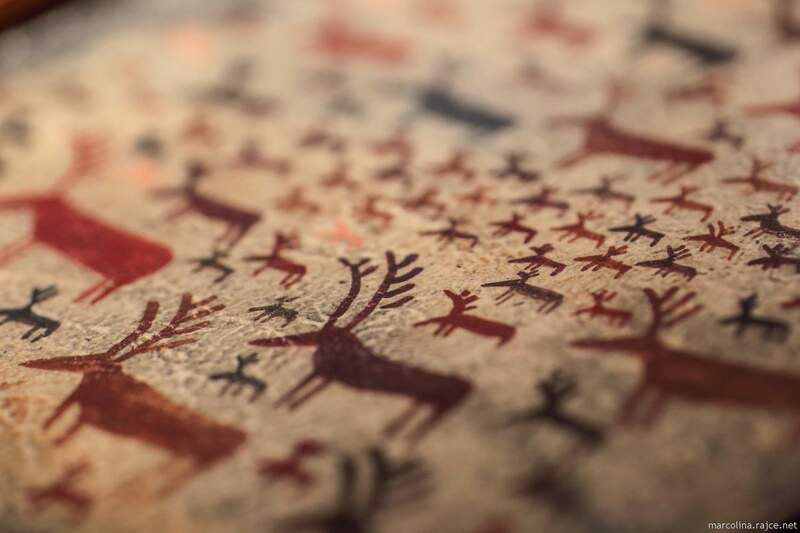 This exhibition sheds light onto the Norse settlement and explorations of unknown lands. These two fine projects, both celebrate Iceland’s central role in the discovery of North America a 1000 years ago by the Norse Vikings. 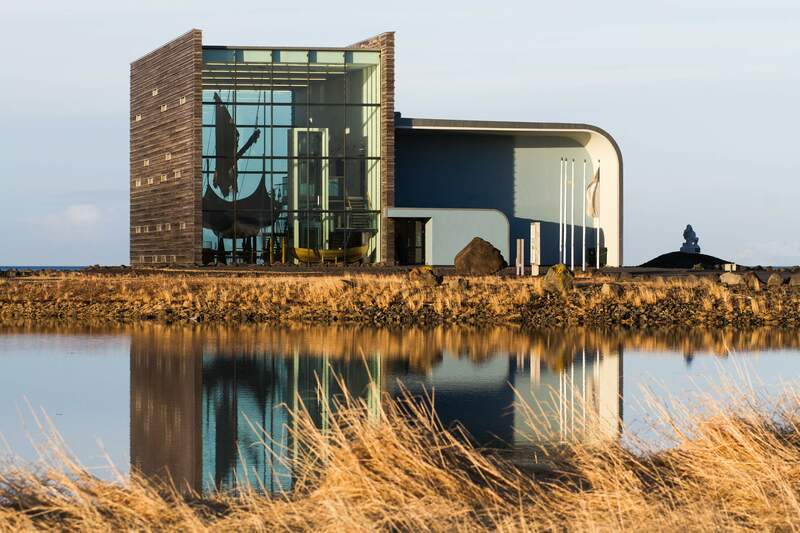 The museum itself is a spectacular modern building situated right by the Faxafloi bay in the town of Reykjanes, and can be easily spotted from the main road between the international airport and Reykjavík. For openings outside regular business hours, please contact the museum directly via email or phone. Excellent museum! My wife and I actually felt this Viking museum was superior to the Viking Saga museum in Reykjavik. If you’re in the area it’s an excellent way to spend a few hours immersed in Viking history. Very impressive and interesting. The lady working on front desk is a credit to your business and made us feel welcome. Definitely worth a visit! Great visit and interesting stop. This is a small museum but really worth a visit. You could spend a couple of hours watching the films and looking at the artefacts. Very friendly and helpful staff. The frame around the Icelander, the exhibition hall itself, was designed by the award winning architect Guðmundur Jónsson. Its modern architecture highlights the beauty of the viking ship the Icelander (Íslendingur). Visitors can look at the ship from all sides and they can even go on board and let the mind take them to explore lands across the sea while they stand on deck of the Icelander. Guðmundur Jónsson has gained over 45 prizes in Scandinavian, Norwegian and Icelandic competitions. Take a bus number 55 from City Hall or the Bus Terminal (BSI) to the stop “Njarðvíkurtorg” or “Miðstöð” (Keflavík city center) and either walk or change to the city bus R2, that stops in front of the reconstructed fishing cottage “Stekkjarkot”. From there it is a short walk to Vikingaheimar. Take a bus number 55 to the stop “Njarðvíkurtorg” or “Miðstöð” (Keflavík city center) and either walk or change to the city bus R2, that stops in front of the reconstructed fishing cottage “Stekkjarkot”. From there it is a short walk to Vikingaheimar.